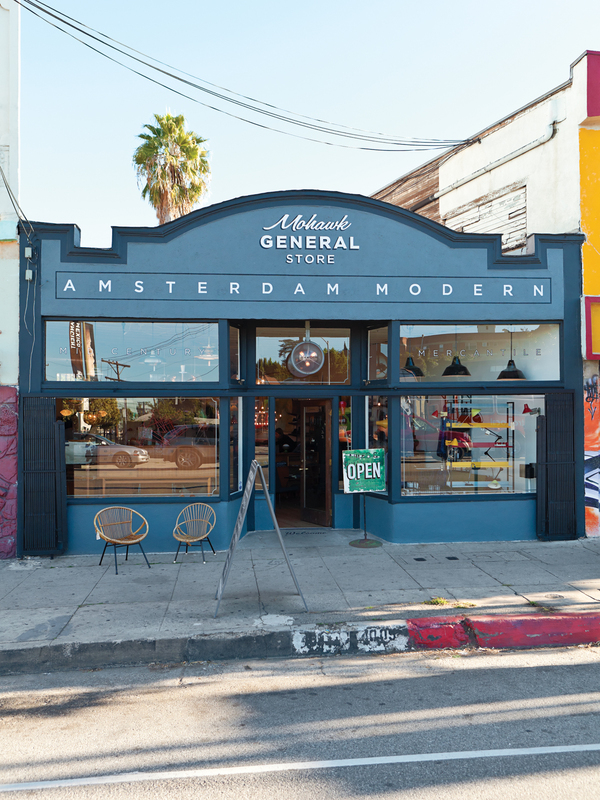 The Mowhawk General Store + Amsterdam Modern is located at 4011 West Sunset Boulevard in the Sunset Junction neighborhood of Los Angeles. In 2008, Kevin and Bo Carney launched Mohawk General Store on Los Angeles's Mohawk Street. Two years later they moved to the heart of Sunset Junction. "We've created a big living room for people," Kevin says. The shop has something for everyone: furniture, lights, ceramics, glass, clothing, books, and music. "The guys go straight for the stereos," Kevin says. The store sees three types of customers: "There's the person who only sees furniture and the person who only see clothing, shoes, and jewelry. Then there’s the shopper who takes it all in and says, 'Wow, I’ve never seen all of this in one place,'” Kevin says. "Our house is exactly like this, only smaller," Kevin says. The coolest finds, Kevin says, are vintage McIntosh amplifiers. The stock changes frequently—"We get new furniture from Ellen every week or so," he says—so it's worth regular visits to for an ever-evolving walkthrough. Up next, Kevin and Bo hope to create more specialty pieces with designers. "It’d be a creative outlet for us and another reason for everyone else to check out our store," he says. Visit Mohawk General Store in person at 4011 West Sunset Boulevard, Los Angeles, California, or online at mohawkgeneralstore.net. Los Angeles’s Mohawk General Store, founded in 2008 by husband and wife Kevin and Bo Carney, is less like a shop and more like a friend’s apartment. Blown-glass and powder-coated steel pendant lamps hang above glass-and-steel tables topped with jewelry and small ceramics; records and design books line the wooden wall shelves; shirts, dresses, and bags designed and made in the United States and abroad drape from hangers; and comfy chairs and sofas give everyone a place to lounge. Though originally on Mohawk Street—hence the name—the store has since relocated to the heart of hipsterrific Sunset Junction. In addition to joining a new retail neighborhood (being able to “park and walk to a few places is a rarity in Los Angeles,” Kevin says), the store also has a new collaborator: Ellen LeComte, who imports furniture from the Netherlands for her wholesale warehouse Amsterdam Modern and the store. “It’s not the normal mid-century stuff,” Kevin says. “It’s things most people here haven’t seen before.” And though some of the goods may be foreign, all the designs feel right at home. What prompted you to launch Mohawk General Store? Kevin Carney: I wanted a place to sell my shoes [Carney is the founder of the Generic Man shoe company]. Now the goal is as much about being continually inspired as it is about being a business. It’s finding an amazing piece and instead of it being a private discovery, letting it be a public experience. What’s the new shop like? We’ve created a big living room for people. You can come in and pick up a book or sit on a couch. The guys go straight for the stereos. What made Amsterdam Modern a good fit as a furniture partner? We did a pop-up shop for Urban Outfitters together. Ellen’s husband is Dutch, and she brings in really different, unique pieces. We appreciate people who come in wanting to be challenged. You also mix local and international designers. There’s an immediacy and intimacy to working with locals and friends. When something sells, you can just call and ask them to drop off another piece. But we mix American brands, such as Engineered Garments, based in New York, with those from abroad that catch our eye, too: A.P.C. from France, Comme des Garçons from Japan, Ellen’s furniture from the Netherlands. How do you select an item to sell? I look for a good story. Customers like that. They like to know the designer, the materials, the details. Who are your new neighbors? This is the center of L.A.’s artist communities. Intelligentsia Coffee is right here. There’s Cafe Stella, a great French restaurant that really reinvigorated the area; Bebop Interiors, a furniture store; Zachary’s Smile, a women’s vintage and new clothing shop; Forage restaurant; ReForm School, a craft and design shop; and even a farmers’ market that happens every Saturday. We’re planning on hosting exhibitions and creating window installations with local artists. We’ve also started making shoes exclusively for the shop. I’d like to do more specialty pieces with designers and cocreate things you can’t get elsewhere. It’d be a creative outlet for us and another reason for everyone else to check out our store. Who: Kevin Carney, Bo Carney, and Ellen LeComte. 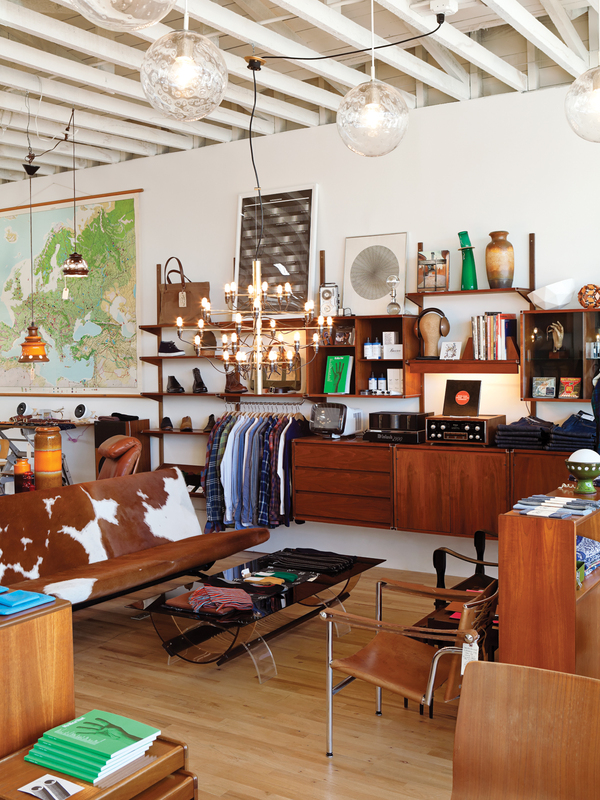 Specialty: Clothing, shoes, and accessories for your person and home, plus mid-century furniture direct from Holland. Top Sellers: Generic Man and Generic Surplus boots and shoes. Coolest Find: Vintage McIntosh amplifier and pre-amp with JBL L88 speakers. To view more photographs of Mowhawk General Store and Amsterdam Modern, please view the slideshow.